Decide on the message you want to use. For us, it is currently: Time is running out! 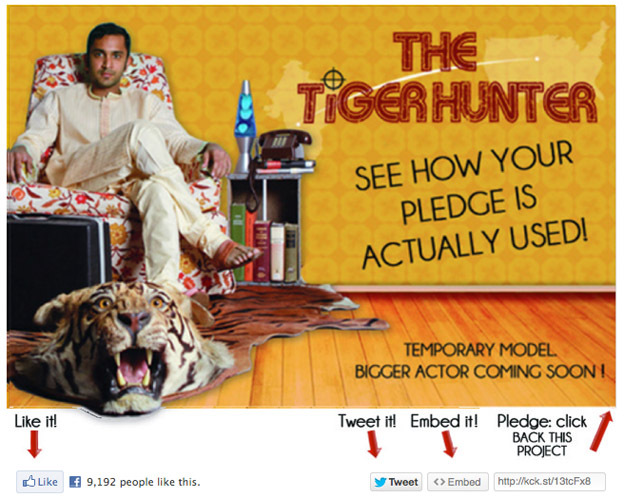 Join @Lena_Khan in making The #TigerHunter film a reality by pledging now at kck.st/13tcFx8! Get the message encoded by clicking HERE. When you launch the campaign, give everyone the link to start the buzz. Make sure to make a Hashtag for your film (ours is #TigerHunter) so you can start trending on Twitter. Try to get influential people to tweet your link. For our campaign, we messaged various comedians and people who might have interest in our film on Facebook, and provided them the link. When you thank people immediately after they pledge, give them a link to keep spreading the word. For us, the tweet said something like, “I just backed The #TigerHunter film at http://kck.st/13tcFx8 on #Kickstarter! Can you join me?” It worked. Be innovative. Since our film was set in the 70s, we set up a Facebook event where we had everyone tweet Michael Kelso (aka Ashton Kutcher) from “That 70s Show.” Hundreds of people ended up tweeting, and it made people more involved in our project. And that’s what crowd-sourcing is about, right? When you launch your campaign, email (personally works best) everyone you know. Make a landing page that has two simple links: one to share on Facebook, and one for Twitter. You will end up with a link that works like THIS: Again, please share for us since you’ve already clicked it! Use the link method outlined above. Even people who don’t know how to web design can do this fairly easily using a basic program like SquareSpace or GoDaddy Website Builder. It helps immensely to put arrows, showing people how they can Like and Tweet your page. Want a template? You can download a Photoshop file HERE. For the most part, we found it serves us best to get featured on blogs that ARE NOT film blogs. The film community is made of people like us (people who need money), so we went to communities that were a smidgen less tapped out. Does your film deal with dancing or music? Find music and dancing blogs. Do you feature a minority? Find blogs and listservs that would be interested. You get the idea. Do a Reverse Image Search through Google. Use the main image of a campaign like yours. For us, we used the image HERE. Voila! Here is a list of blogs and pages that featured the Man-Child campaign. You can see if some of them might be interested in your campaign as well. In contacting blogs, it’s important to be useful. Have nothing to offer (be it content, interest to their readers, etc.)? Then don’t contact any blogs. Brace yourself and see how it goes! So far, those tools have been IMMENSELY useful for us, and hope they are for you, too! Did you benefit at all? We still need pledges for our Kickstarter campaign, which is ending soon. Learn more about it by clicking HERE. Lena Khan is the writer and director of the upcoming dramatic comedy, The Tiger Hunter. You can learn about her film and Kickstarter campaign HERE.